As children, we delighted in the gift-giving and receiving, the special activities, the lights, the cookies, the stories, and all the things that came together to make the Christmas season special. Suddenly each of those activities required planning and preparation. Then they multiplied into many more obligations needing crammed in to an already hectic schedule. For many adults, Christmas becomes a season to survive rather than a season to celebrate. Somewhere along the way, many of us feel like somehow we’re missing the whole point. - Our yearly Christmas program is a simple rather than elaborate production during a regular evening worship time of our church. We perform it to glorify God, not ourselves. We also schedule it on a Sunday when we’d usually have a fellowship meal, so that we’re not adding an extra event to the normal calendar. - We don’t have a separate program for children, youth, adults, or other special choirs. We do one program and each group has a small part in it, so that we’re not adding additional stress to the season. The children generally practice their small part at the end of the Sunday school hour and/or for a few minutes immediately after our regular mid-week children’s program. - We do have other celebratory events, but they’re also kept simple and scheduled during our regular meeting times. - As a family, we carefully evaluate the events and activities we attend or participate in. We don’t become hermits, but we do purposefully slow our social calendar down and spend more time together instead. - We focus on our relationship with God. We let Him center us as only He can. I will often begin a new study or devotional that helps me to know Him more. When we simplify the season, we also make room for a more meaningful event in our lives and in the lives of those around us. We can volunteer in local organizations that make a difference in our community, and give the gift of our time and talents to others. And most of all, we make room in our lives for true worship and communion with God, who rescued us from a path of self-destruction and replaced it with an abundant life. Several years ago, inspired by some of my fellow online pastors’ wives, I put an end to the endless shopping to find gifts for those who already have everything they could possibly want or need, and started donating to charities in their honor instead. I did this for family, church workers, and even school teachers (how many apple-themed knick knacks or gallons of shower gel do they really need?) I matched their interests with gift ideas from the World Vision Gift Catalog, or I donated to a charity they already work with, such as the Gideons or denominational disaster relief organizations. This year, thanks to other pastors’ wives from around the world, I’ve also become aware of Tearfund, Heifer International, and The Leprosy Mission. Looking for something more? Then perhaps you’re up to the Advent Conspiracy. I took the challenge a few years back and organized a charitable giving fundraiser for the Pure Water, Pure Love ministry. We can also be creative in how we give to others. Fair trade organizations like World Crafts and Trade As One offer opportunities to buy gifts that help families in developing nations earn a living wage and break the cycle of poverty. This trading relationship also gives missions personnel an inroad for sharing the gospel. This evening, I just spent some time perusing an article in my local paper detailing wish lists of local charities, and pondering where/how we might serve. It is my firm belief that we are to minister first in the field we are planted, so I always try to go local first. I would encourage everyone who reads this article to be open and sensitive to a worthy cause God may be laying on your heart this Christmas season. And please… tell us about it in the comment section or link up your posts so that we can all share in the joy! May God bless you with a worshipful and meaningful Christmas. "Thanks makes now a sanctuary." I'm relaunching the monthly pastors' wives link-up, and how fitting for November if we talk about thankfulness. I would love to read your thankful posts. We all have struggles, and there's always space to talk about that. But this month, I'd especially love to hear about things and/or people you're thankful for in your church. 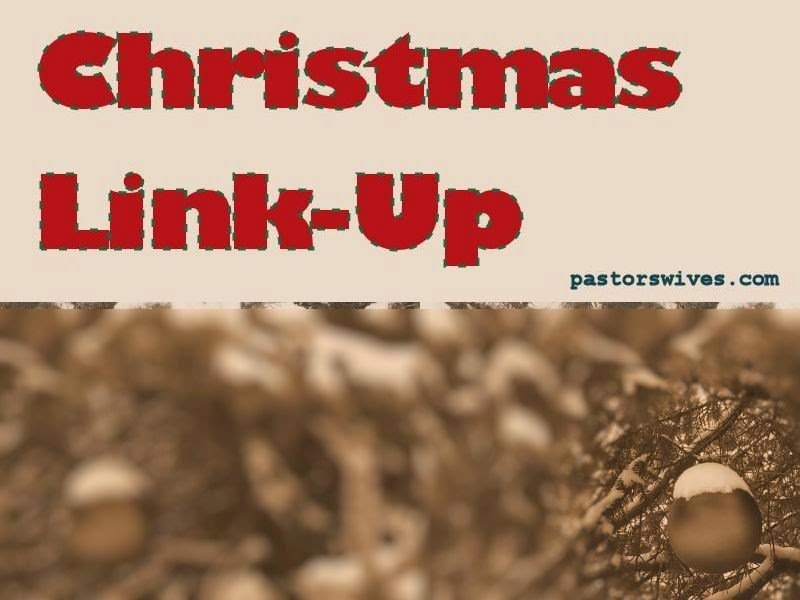 Feel free to link up old posts as well about ways being the pastor's wife has brought you joy/made you thankful. Or, if you have a "thankful" tag/label/category on your blog, link to that! Need some inspiration? 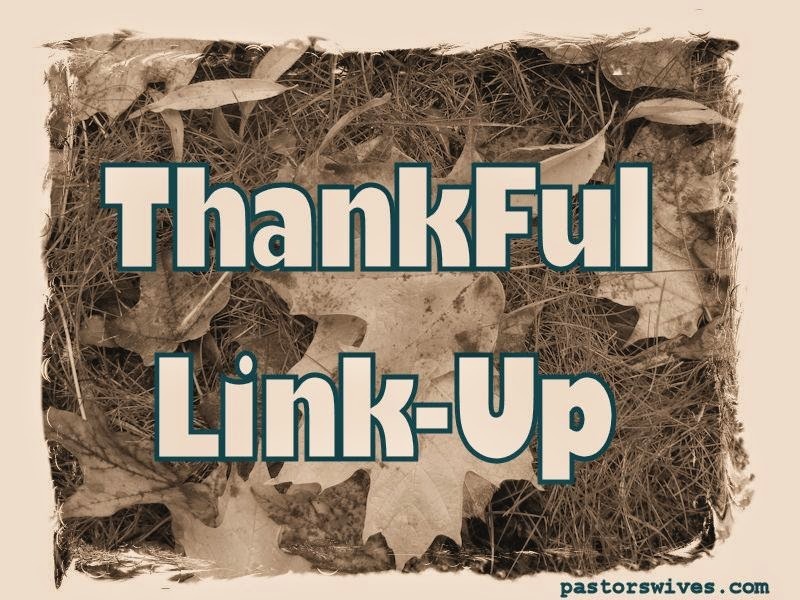 Check out these thankful posts from Atypical Pastors Wife! We have a new domain name (PastorsWives.Com) that should make navigating our site easier. If you link to our site, please update your links. The **link graphics** have been updated for your convenience. On that note, I ran into an unexpected glitch in the transfer -- I lost all of the blog lists that enable recent posts to populate in the sidebar. For some reason those were tied to the old domain name. I've attempted to rebuild those lists, and will continue to do so; but if you notice that yours is missing the next time you update your blog, please accept my apologies and do let me know so that I can re-add you. Also, if you discover anything odd beyond a few old posts that suddenly re-posted themselves on twitter, please contact me! I especially want to correct any broken links. You can alert me by commenting on this post, or use a contact form I recently installed to make getting in touch with me more convenient. Despite my long absence, I do intend to blog here again in the future. In the meantime, I hope that you've been able to enjoy a blogroll that delivers you fresh content and minimizes dead links!